The town of San Gimignano is surrounded by three sets of walls and retains 14 of the original 72 medieval towers. Each tower was built by one of the noble families who vied with each other on who could build the tallest and most beautiful. The higher the tower, the greater the prestige! Throughout the earily Renaissance two families: the Ghibelline and the Guelphs of Florence were at war between each other causing much havoc and internal strife. Finally, in 1353 the town surrendered to the Florentines after centuries of resistance. What makes San Gimignano so remarkable is the way it is perfectly preserved. Two splendid squares dominate the architecture, in one there is an old 13th century well, in another the main duomo (church). You can climb some of the towers and enjoy the incomparable views of the hills in every direction, in particular from the Museo Civico (museum). Civil weddings are held in one of the frescoed halls of the museum where Dante used to deliver speaches in favor of the Guelphs. 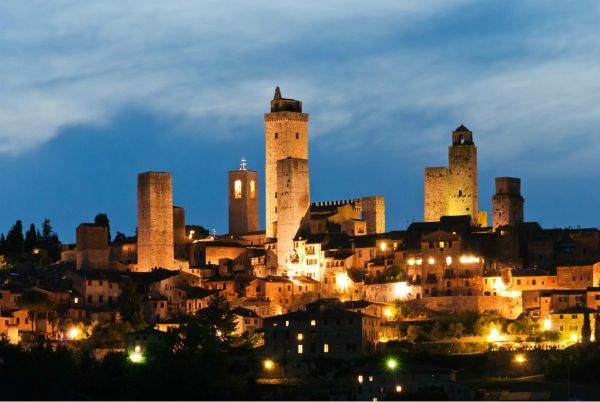 But best of all San Gimignano is a place to discover on foot, climbing up to La Rocca, the fortress which is now a park or sitting at a café enjoying a cool glass of the Vernaccia white wine this region is so famous for. Wedding receptions in San Gimignano will take advantage of everything Tuscany can offer, food is of primary importance to Tuscans and the full flavours of the local cuisine are something your guests will never forget. Whether you choose to hold your reception in a restaurant in the heart of San Gimignano or in one of many villas – both private and hotels – or the romantic castles, San Gimignano is sure to be a happy choice for couples wanting to marry in Tuscany.